On the 11th November one of our Year 11 students Nathan led the whole school assembly on the subject of Remembrance Day. He talked about why we wear a poppy, how the Royal British Legion supports those injured in war or the families of those bereaved, as well as how those who have fought are remembered with a minute’s silence and the playing of the last post. At the end of the assembly he quoted Laurence Binyon’s poem; ‘They shall not grow old as we who are left grow old, Age shall not weary them or the years condemn, At the going down of the sun and in the morning, We will remember them’. 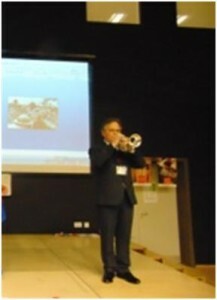 Mr Hall from Tees Valley Music Service then played the Last Post – something which many learners and staff found especially powerful. Rebecca also from Year 11 supported the assembly by producing a PowerPoint; both Rebecca and Nathan recently visited the First World War Battlefields as part of the government programme to commemorate the centenary of the First World War and were keen to share what they had learnt with the rest of the school. Later in the day, Mr Eyre introduced the minute’s silence over the tannoy and all the campus classrooms and corridors fell silence as a mark of respect to those who have fallen fighting for their country. As Nathan said in his assembly, ‘It is important to remember because for our today many bravely gave their tomorrow’.